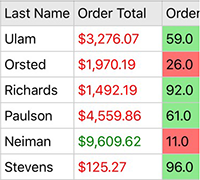 Display tabular data across columns and down rows with this simple, powerful grid control. FlexGrid for Xamarin is available in Xamarin.Forms, Xamarin.iOS, and Xamarin.Android. Available in Xamarin.Forms, Xamarin.iOS, and Xamarin.Android. Effortlessly select multiple cells and rows by dragging touch-friendly adorners. Row and column freezing keeps the most important information visible while scrolling. 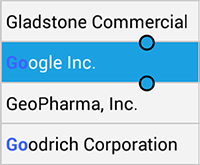 Designed for a mobile world, FlexGrid also supports column resizing by touch. Create adaptive column layouts that proportionally resize themselves again given the page size. Eliminate horizontal scrolling and create mobile-friendly lists using column star-sizing techniques similar to the XAML Grid control. Better utilize screen real estate by displaying details within a collapsible cell beneath each row. FlexGrid supports application and device themes that look professional next to standard toolkit controls. Populate FlexGrid with any collection of business objects. Instant grid creation on all platforms with automatic column generation. In Xamarin.Forms, columns can be defined and bound directly in XAML following MVVM design practices. Load real time data on demand with help from the C1CollectionView. Create an unbound grid by adding rows and populating the cells manually. Get intuitive sorting out of the box when tapping column headers. Filtering can be extended to the user in the form of a search box or input form. 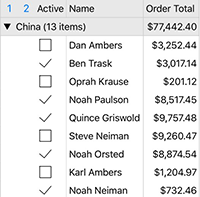 When grouping, you can display summarized aggregates on grouped rows. Reduce noise and improve organization with automatic cell merging of adjacent columns with the same value. Group columns into more-readable sections with multi-line column headers. Format numeric and date columns for ideal readability using simple format strings. 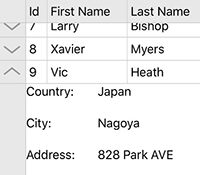 Display relational data lists as pickers in cells with built-in data mapping. Apply conditional formatting to highlight certain cells. Customize the cell content with UI elements or provide custom cell editors for any data type.